Edited by GolfProRM, 14 December 2009 - 11:22 AM. Tip: Getting apps to properly hide in the system trayIf you have an app that used to hide away nicely in the system tray, but won't seem to do-so in Windows 7 (e.g. Windows Live Messenger), there's an easy workaround to get it to leave your taskbar. 1. Exit the program completely (you may have to exit it from the system tray). 2. Go to Start Menu, locate the shortcut of the program you wish to "fix." 3. Right click on the shortcut and select Properties. 4. Go to Compatibility tab. 5. Tick the check box for Run this program in compatibility mode for under “Compatibility Mode”, and then select Windows Vista (Service Pack 2) from the drop down list. 6. Click OK. 7. Restart the programNow, when you minimize the program to the tray, it should disappear from the taskbar completely. Here's a tip for auto log-in in Win7 1. Press the Windows key + R on your keyboard to launch the Run dialog box. 2. Type in control userpasswords2 3. Press Enter. The User Accounts window will display. 4. Uncheck the option Users must enter a user name and password to use this computer 5. Click OK 6. You will then be prompted to enter the current password and confirm it. 7. After doing so, you will no longer be prompted to enter your password upon login. Auto log-in can be a security risk if you are not the only user on a computer! Here are some keyboard and mouse tips!Window Management ShortcutsOne of the best changes in Windows 7 is the ability to "snap" windows to the side of the screen, maximize them by dragging to the top of the screen, or even move them to another monitor with a shortcut key.Win+Home: Clear all but the active window.Win+Space: All windows become transparent so you can see through to the desktop.Win+Up arrow: Maximize the active window.Shift+Win+Up arrow: Maximize the active window vertically.Win+Down arrow: Minimize the window/Restore the window if it's maximized.Win+Left/Right arrows: Dock the window to each side of the monitor.Shift+Win+Left/Right arrows: Move the window to the monitor on the left or right.You can also interact with windows by dragging them with the mouse:Drag window to the top: MaximizeDrag window left/right: Dock the window to fill half of the screen.Shake window back/forth: Minimize everything but the current window.Double-Click Top Window Border (edge): Maximize window vertically.Taskbar ShortcutsIn Windows 7, using the Windows key along with the numbers 1-9 will let you interact with the applications pinned to the taskbar in those positionsfor example, the Windows key + 4 combination would launch Outlook in this example, or Win+Alt+4 can be used to get quick access to the Outlook Jump List from the keyboard.You can use any of these shortcut combinations to launch the applications in their respective position on the taskbar, or more:Win+number (1-9): Starts the application pinned to the taskbar in that position, or switches to that program.Shift+Win+number (1-9): Starts a new instance of the application pinned to the taskbar in that position.Ctrl+Win+number (1-9): Cycles through open windows for the application pinned to the taskbar is that position.Alt+Win+number (1-9): Opens the Jump List for the application pinned to the taskbar.Win+T: Focus and scroll through items on the taskbar.Win+B: Focuses the System Tray iconsIn addition, you can interact with the taskbar using your mouse and a modifier key:Shift+Click on a taskbar button: Open a program or quickly open another instance of a program.Ctrl+Shift+Click on a taskbar button: Open a program as an administrator.Shift+Right-click on a taskbar button: Show the window menu for the program (like XP does).Shift+Right-click on a grouped taskbar button: Show the window menu for the group.Ctrl+Click on a grouped taskbar button: Cycle through the windows of the group.More Useful Hotkeys You Should KnowThe new hotkey goodness didn't stop with the taskbar and moving windows aroundone of the best new hotkeys in Windows 7 is the fact that you can create a new folder with a hotkey. Just open up any Windows Explorer window, hit the Ctrl+Shift+N shortcut key sequence, and you'll be rewarded with a shiny "New Folder" ready for you to rename.Here's a few more interesting hotkeys for you:Ctrl+Shift+N: Creates a new folder in Windows Explorer.Alt+Up: Goes up a folder level in Windows Explorer.Alt+P: Toggles the preview pane in Windows Explorer.Shift+Right-Click on a file: Adds Copy as Path, which copies the path of a file to the clipboard.Shift+Right-Click on a file: Adds extra hidden items to the Send To menu.Shift+Right-Click on a folder: Adds Command Prompt Here, which lets you easily open a command prompt in that folder.Win+P: Adjust presentation settings for your display.Win+(+/-): Zoom in/out.Win+G: Cycle between the Windows Gadgets on your screen. I never ran Vista and I only know one person I help with Vista. He has the Win 7 upgrade disk waiting for me to help him upgrade as soon as I gather all the info. I don't want him to be one of those stuck in a reboot loop. First off, a little maintenance: Right-click on the Start Orb, select Properties from the popup context menu, click on the Taskbar tab and de-select (uncheck) the Lock the taskbar option. Right-click on any empty spot of the Taskbar and select Toolbars → New Toolbars from the popup context menu. When the New Toolbar - Choose a folder window appears select "C:\ProgramData\Microsoft\Windows\Start Menu" as the directory to use for a Toolbar and click on the Select Folder button to choose it. After the new Start Menu toolbar has been made, drag it over all the way to the left until it is between the Start Orb and your pinned applications. Move your cursor over the separator bar beween the Start Menu toolbar and the and drag all the way to the left until all that is visible is the "Start Menu »" text. If you click on the "»" glyph you should now see a familiar menu tree. Right-click on the Start Menu text and select Open Folder from the popup context menu. The Start Menu directory will appear. Navigate to the Accessories directory, right-click on the Run shortcut and select Copy from the popup context menu. Navigate back to the Start Menu directory, right-click in any part of the empty window and select Paste from the popup context menu. Thanks AG. That's one thing I will probably do. Great tip, but I love the windows 7 start menu. Especially the ability to hit the windows key, then start typing to find a program. No need to browse through the whole list. Western slope La Salle Mtns, Utah Taken May 16, 2004 by Me. Bring the Quick Launch toolbar back to Windows 7 In the Nov. 5 Known Issues column, Ed Kirkpatrick described how he created a custom Windows 7 toolbar to replace the Quick Launch toolbar, which is missing by default in Win7. David Shirly was one of several readers who provided us with instructions for restoring Win7's Quick Launch toolbar:"Regarding Dennis O'Reilly's piece on Windows 7 early adopters: Quick Launch is still available, but it's hidden by default. You have to know where to look:C:\ Users \ username \ AppData \ Roaming \ Microsoft \ Internet Explorer \ Quick Launch"Simply create a new toolbar and point to this location. You'll have to enable 'show hidden files' to find it." I read that somewhere. No biggy for me though since the interface looks nice without it. I like the application bar (I'm guessing on the name of it) where IE, Windows Explorer, Windows Media Player reside. I especially like the way that multiple windows explorer windows group together and if one is in the process of copying/moving files the icon will have a green hue that moves from the left to the right as the copy progresses. Some tips from Terry Blounthttp://windows7forum...-windows-7.htmlhttp://windows7forum.../blogs/tblount/XP or Vista style start menu-freebieshttp://www.vistastar....com/index.htmlThe Vista Start Menu is very slick and customizable. You can set it to start with windows and have it replace the Win 7 menu.It has three skins available.Shown below is the Vista skin. http://www.csmenu.com/CSMenu on the other hand is very basic with little chance for customization.Another handy tool is Free Launch Bar-free as wellhttp://download.cnet...4-10333488.htmlFree launch bar lets you create a Quick launch like taskbar tool.You can create individual menus with shortcuts. Very cool.Shown in the screen shot below is an example of my application of Free Launch Bar. The expanded menu is filled with various tools apps.The menus are separated by separators and have little black arrow points.I have about 140 shortcuts at my command in 9 menus.The icons without separators are actuall standalone shortcuts for my most frequently apps.Simply clicking on a menu expands it.Hovering your pointer over a menu pops up a balloon tip with the name of the menu.I name the menus based on the shortcuts in them.For instance the menu identified by the camera icon is for imaging apps and is named "Imagers".You can create menus within menus as well.You will see an example of that at the top of the expanded tool menu in the screen shot.There are 4 of them and they have an arrow point to the right like the main menus do.As you can see my desktop is uncluttered with only 22 shortcuts. Edited by Frank Golden, 14 November 2009 - 02:02 PM. Me too ... that is one of the really good things they did for sure! But there really are a lot of things to like about Windows 7. Yep, and you can drag anything you want to the application bar so it's really easy. If you have any programs or devices (like an older Palm you really like) that doesn't run in Windows 7 (particularly 64-bit), then be sure to get Windows 7 Ultimate or Professional/Business (prefer Ultimate myself), so you can download the free Windows XPMode and VirtualPC from Microsoft to run them. This has come in very handy on 64-bit Windows 7 computers running Ultimate where like I mentioned there was an older Palm that they needed support for, or an older version of some software you can't live with out.Very handy indeed. Win Home: Minimize all but the active window. Win Up-arrow: Maximize the active window. Win Shift Up-arrow: Maximize the active window vertically. Win Down-arrow: If the active window is Maximized, Restore it. Otherwise Minimize the active window. Win Left-arrow: Dock the active window to the Left side of the Screen. Win Right-arrow: Dock the active window to the Right side of the Screen. Win Shift Left-arrow: Move window to the monitor on the left. Win Shift Right-arrow: Move window to the monitor on the right. Present only on the primary (Computer only) monitor. Duplicate the presentation on all monitors. Extend the presentation across multiple monitors. Present only on the secondary (Projector only) monitor. Drag window to top (and release mouse button): Maximize the window. Drag window left/right (and release mouse button): Dock the window to fill half of the screen. Double-Click the very Top or very Bottom EDGE of a Window: Toggle between Vertically Maximized and Restored. Position on the taskbar as well as pinned or un-pinned is very important for most of these keyboard shortcuts. In conjunction with the Windows Key and other possible modifier keys the number keys [1-0] (1,2,3,...9,0) correspond to the first ten positions on the taskbar. Right click on any program running on the taskbar for a menu allowing you to pin/un-pin the program to the taskbar. You can choose where applications are positioned on the taskbar by simply dragging them into place with your mouse. Starts the application pinned to the respective location on the taskbar. Or switches to the running application found at that location. Or if there are multiple running instances of the application at that location, cycle (aero peak) through each instance of the application. Win Shift [1-0]: Start a new instance of the application found at that position. Win Alt [1-0]: Open the Jump List of the respective application. Hint: Navigate with up/down arrow keys after release. Win T:cycle focus forward though each application on the taskbar. Hint: Press enter to activate/start the respective application. Win Shift T: cycle focus backward through each application on the taskbar. Win B: Give Focus to the first item in the System Tray. Hint: Release, then Right-arrow/Left-arrow to navigate and Enter to activate. Shift Click on a taskbar button: Open a new instance of the program. Ctrl Shift Click on a taskbar button: Open a program as an administrator. Shift Right-click on a taskbar button: Show the (XP style) window menu for the program. Shift Right-click on a grouped taskbar button: Show the window menu for the group. Ctrl Click on a grouped taskbar button: Cycle through the windows of the group. Drag taskbar buttons to the position you want. Drag System Tray icons to the position you want. Includes dragging them in and out of the System Tray's Show hidden icons Window. Ctrl Shift N: Creates a new folder. Alt Up: Goes up a folder level. Alt P: Toggles the preview pane. Shift Right-Click on a file or folder: Adds extra otherwise hidden items to the context menu. Some sites say aero must be enabled. (+/-) may refer to numeric keypad only?On my laptop Win + starts Windows magnifier, but Win (+/-) has no affect even though aero is fully enabled. Win G: Cycle through active Windows Desktop Gadgets. Win Shift G: Cycle backward through active Windows Desktop Gadgets. Win F: Opens a Search window for finding files or folders. Win Ctrl F: Open a Search window for finding a computer on a network. Win L: Lock the Computer (switch user). Win U: Ope the Ease of Access Center applet in the Control Panel. Edited by rbdietz, 17 December 2009 - 07:13 AM. Here's another site with many really good tips, explained in detail, on customizing/tweaking WIN7 for speed, performance and looks:TechRadarThanks to Fred Langa's blogpost for the tip. I've just bought a netbook with Windows 7 Starter. I'm finding the absence of the Quick Launch bar really a problem, and though I followed the instructions elsewhere in this thread to install the Quick Launch Bar, I'm finding it more cumbersome than the one I have on my WinXP Pro desktop. Thus, I am very interested in what you say about using the Windows key, but I can't figure out a way to set it to bring up non-Microsoft programs. Is the [win] ph built in to open photoshop, or did you somehow re-set the Windows key to do that? If the latter, I'd love to know how to do that. I'm not interested in running photoshop on a netbook, but there are a number of less resource-intensive programs I'd like to be able to open with the Windows key. Is this possible?Thanks in advance for your help. Using Libraries for additional control of the content of Desktop Background Slide Show.You've got a bunch of themes installed. Several of them are Christmas themes which each include half a dozen or so different Desktop Backgrounds (Wallpaper). Wouldn't you like to include all of the backgrounds from all of those different Christmas themes in your Desktop Background Slide Show? If so, here is how to do it.First, lets make a library to keep track of your seasonal backgrounds. If it isn't already, make Libraries the active node in the Navigation Pane. Click the New library button on the Command Bar. Give your new library a name - Seasonal Backgrounds - for instance. Navigate to the Documents folder. Click the Include folder button at the bottom of the Include folder in Seasonal Backgrounds window. Next, let's find the content to put in our Seasonal Backgrounds library. Select system drive (probably C:) as the active node in the Navigation Pane. 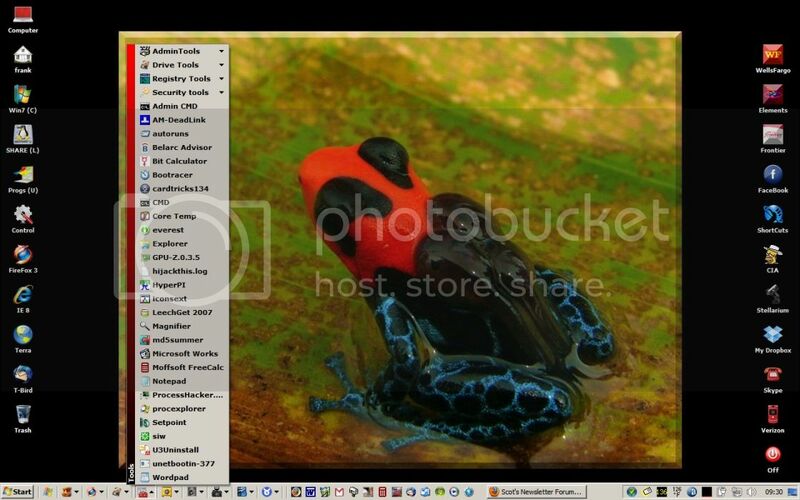 Type desktopbackground into the search box at the upper left of the explorer window and press Enter. 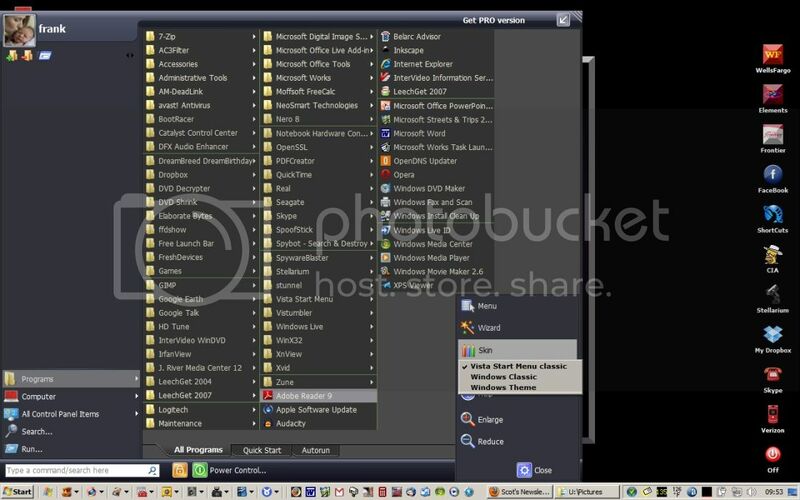 When the search is complete, you'll see numerous DesktopBackground folders in the Details Pane. One at a time, using your Right Mouse Button drag and drop the folders you want to Seasonal Backgrounds library and choose Include in library from the context menu that pops up. Finally, let's set up our slide show. Type Change Desktop Background and press Enter. Click the Browse... button; navigate to and select the Seasonal Backgrounds library. If there are any particular backgrounds you don't want to include, uncheck them. Edited by rbdietz, 16 December 2009 - 08:31 PM. Not really a tip but..MS just recently re-released their "improved" GUI tool to create a USB flash installer for Win 7 all versions.As you may or may not know their original release was found to be in violation of the GNU General Public License v2 (GPLv2)and they removed it from the MS store because of that.This new version is in compliance with GPLv2 and the source code is available.Windows 7 USB/DVD Download Tool Released Under GPLv2 - Port 25: The Open Source Community at MicrosoftThere are live links to the D/L site and the source code site.I tried the new version (installed on both XP and Win 7 HP) and it worked flawlessly.Created a USB flash installer in less than 10 minutes from Win 7 .iso file.It also has an option to create a DVD installer as well.It won't work from the DVD installer but there are many tools available to convert a Win 7 DVD to an .iso file.If you bought your copy of Win 7 online it will be in an .iso form.The one I use is called ISO Recorder v 2 and is a Windows Power Tool.ISO Recorder v 2If you purchased the student version of Win 7 from Digital River it will not be an .iso but the individual files that need to be made into an .iso to use Windows 7 USB/DVD Download installer.ISO Recorder can do that as well.This tool is very easy to use and does a great job converting a disk or files to an .iso file.